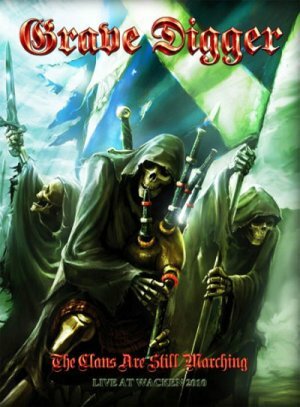 GRAVE DIGGER - THE CLANS ARE STILL MARCHING LTD. EDIT. (DVD+CD DIGI) | Online Shop | Wizard LTD. Album: "THE CLANS ARE STILL MARCHING LTD. EDIT. (DVD+CD DIGI)"
One cannot think of a better location to loudly celebrate a metal anniversary than the legendary Wacken Open Air festival. Grave Digger never thought twice than to mark their 30th anniversary with a metal extravaganza that would allow their most loyal fans to celebrate with them at the metal Mecca. This once-in-a-lifetime evening delivered the band&apos;s classic "Tunes of War" in its entirety. Thousands of headbangers shared in the enjoyment of timeless anthems such as "Scotland United", "The Dark of the Sun", and of course, "Rebellion". Staying true to the evening&apos;s theme, frontman Chris Boltendahl performed in Braveheart-inspired garb. Yet he had more surprises up his sleeve, as he welcomed guest artists Van Canto, Hansi Kursch (Blind Guardian), and metal queen Doro Pesch to join him on stage. The DVD "The Clans Are Still Marching" captures the energy of this unique evening and delivers it to living rooms everywhere. The DVD also comprises backstage footage, interviews, the video of "Highland Farewell" and its respective "Making of...", as well as all the live tracks on CD.